Bring vegetable stock to a boil in a saucepan, reduce heat to low, and stir in quinoa. Cover pan and simmer for 10 to 15 minutes. Remove from heat. Heat olive oil in a large skillet over medium heat. Cook and stir butternut squash and zucchinis in the hot oil until slightly browned, about 10 minutes. 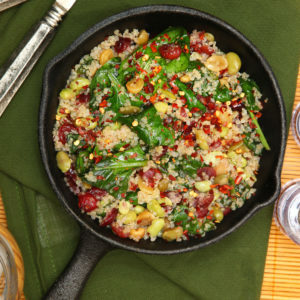 Stir quinoa into the vegetables and gently mix green onions, cranberries, and parsley into the stuffing.